She sat across from him in the booth. Sat holding the cup of coffee in front of her with bent and twisted fingers filled with rheumatism. Head bent down she tried to hide her face from him. Tried not to reveal the tears flowing down her cheeks. Tried to be stoic and brave like he was. But it was no use. Big tear drops splattered onto the top of the booth’s table. She was an old woman well into her seventies. Dressed in a simple cotton dress with a shawl pulled up over her gray white hair and partially hiding her grief. There was no make up. No fancy shoes. No expensive purse. Just decades of pain, grief, and hopelessness. Across from her the old man watched his wife of forty years with the pale complexion of a man not teetering on the edge of his grave. Arms on the table and crossed, he sat bracing himself close to the table, an untouched coffee cup pushed to one side. He was an old man with a face creased and burnt from generations of hard work, bitter disappointment, and no luck. Yet there was a set in the man’s lips . . . a glint in the man’s eyes . . . that also suggested defiance. An unwillingness to give up. Glancing to the heavy set Hispanic waiter standing behind the counter with a wet towel in his hand, a half smoked cigarette dangling from one corner of his lips and a look of pure boredom on his face as he dried dishes, he turned and leaned closer to his wife. One of his old, calloused, shriveled hands slid across the table top and settled on top of one of hers tenderly. She half lifted her head, shaking it softly from side to side, and sighed. He thought about saying something but decided to remain quiet. So they sat. The two of them. Holding hands in a small, brightly lit all nighter silently consoling each other’s misery as the rain outside in the darkness of the night continued to fall relentlessly. But a half hour later movement registered in the rain. Two shafts of light, the low beams of a car, cut through the rain and clinging darkness like twin swords. Turning his head the old man watched with disinterest as low beams flashed once down a side street then made a sharp right hand turned toward the all nighter and began to approach rapidly. For a long time all the old man’s eyes could make out were the bright spots of a car’s headlights. Growing larger as he watched. But saw no car. And then suddenly the lights snapped off and through the large plate glass window beside him he saw the outline of a big, powerful . . . black . . . Cadillac XTS sedan sitting in a parking stall only a few feet away from the window. A ghost, he thought to himself. A harbinger of Death. Madri de Dios! The interior dome light of the car lit up as the driver’s side door opened. Eyes narrowing he watched a man stand up, move to one side, and close the car door behind him. He was not a tall man. Neither was he short. He was wearing a long black overcoat that seemed to softly reflect the bright neon light of the all nighter seeping out through the window and into the rain. He could not see the man’s face since most of it was hidden under a dark fedora with its brim snapped down low over his forehead. But he did notice the gloved hands. The tight leather gloves of a professional race driver. With long, almost delicate fingers. The old man had an urge to turn and watch the dark man step into the bright radiance of the neon lights. But he resisted the urge and turned back and gently held onto his wife’s hand with both of his. Behind him the dark eyed man entered the all-nighter swiftly and silently. Lifting a gloved hand up he removed the fedora from his head, shook the rain off it gently, then glanced at the Hispanic standing behind the bar. Without saying a word, and hardly moving a muscle, the man and his cigarette nodded and glanced at the old couple. The dark eyed man’s eyes moved toward the old couple sitting in the booth. The cook/dishwasher/waiter and the old couple were the only souls in the cafeteria. Empty seats lay before the dark eyed man. He didn’t hesitate. With one smooth motion he slid into the both the old man sat in, setting the wet fedora on the edge of the table beside him and laying gloved hands, one atop the other, on the table in front of him. Both the dark eyes of the stranger and the watery eyes of the old man turned to look at the woman across table. There was anger . . . determination . . . a mother’s fierce portrait of defiance clearly etched into her old face. The black eyes of the man looked into the craggy, aged face of a small woman grieving for the loss of her only child and nodded quietly. One gloved hand came up off the table and reached inside the black overcoat he was wearing. Pulling out a thick envelope he sat it on the table top and used a gloved finger to push it toward the woman. The old man and old woman nodded silently as their eyes rested on the thick envelope bulging with one hundred dollar bills. Coming to his feet the dark eyed man slipped the fedora over his brow, made sure the brim was snapped down, and turned toward the all nighter’s lone employee. Without saying a word he looked into the man’s eyes and barely nodded his head before slipping out into the rain. As the big XTS Caddy disappeared into the night the old man and his wife turned their heads toward the cook. The cook, shrugged, started to turn to go into the back of the all nighter but answered softly. A block away from the all nighter the black as sin Cadillac doused its lights, slowed, then whipped around in a violent U-turn and headed back down the street it had just traversed. With lights still off it moved across the wet streets of the inner city residential area before slipping into a parallel sparking slot maybe ten cars back from where the bright neon lights of the all nighter glowed through the falling rain. The driver’s side door open quickly and the compact, athletically built man slid out and closed the door quietly. Walking to the back of the car he clicked a button on the set of keys in his gloved hands and the rear trunk lip popped open. Reaching inside he pulled out a large ball peen hammer and closed the lid before stepping up on the sidewalk. Through the darkness and rain the man in the long black overcoat and fedora walked with a purpose holding the hammer down by on leg. Black eyes . . . as black as the night . . . were latched onto the shadowy form of an old Chevrolet pickup truck setting beside the curb five cars away from where he had parked. Through the heavy cold rain he could see the silhouette of a man sitting behind the steering wheel pickup quietly smoking a cigarette. The man was intent on watching the old couple sitting in the all nighter and talking to the cook. Never once did he turn his head and glance in the rear view mirror. When the round edge of the ball peen hammer smashed into the driver’s side window the glass splattered into a million pieces and rained down onto the wet pavement with the ringing sound of a thousand tiny rocks splattering into puddles of water. In the truck the lone occupant leapt in surprise, throwing up arms to protect himself. Violently a hand grabbed him by the shirt just underneath his throat and ripped him out of the pickup and threw him onto the wet pavement. The hammer gripped in a gloved hand lifted up high and came down hard. There was a loud, audible, ‘Crack!’ as the bone in his upper right arm snapped into like a twig. A gloved hand clamped across the man’s mouth as he screamed in agonizing pain. He fought to remove the iron gripped hand covering his mouth. But he could not. He twisted around and tried to bring a leg up and kick his attacked in the face. But the hammer came down again with a violent swing and shattered his right kneecap with one blow. About to pass out from the blinding pain he felt himself being hauled up onto his one good leg and slammed against the bed of his pickup. Through the rain . . . through the agony . . . the terror! . . . he opened one eye and tried to focus on the dark form standing in front of him. 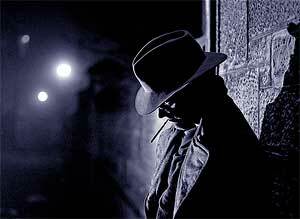 All he could see was a shadowy black image wearing a fedora with a snapped down bill hiding most of the man’s face. Only the bottom part of the man’s nose, a pair of lips, and a strongly carved outline of a jaw was visible. Through the driving rain the man saw the gloved hand holding the ball peen hammer lifting up into the night as the grip of the man holding him upright tightened and began to choke him. The hammer paused in mid motion. The rain was driving straight into his face. The dark, unrecognizable figure in front of him stood motionless. The seconds ticked by incredibly slowly. And then, cutting through the rain . . . that voice. That strange, quiet, yet penetrating whisper. The hammer came down. Swiftly. Brutally. But not fatally. The blow caught the killer in the middle of his forehead and knocked him out cold. 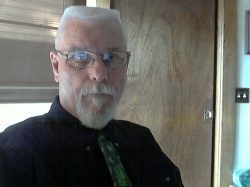 Dropping him into the street, standing up, the dark man underneath the dark fedora stared at the unconscious form at his feet for a second and then reached inside a coat pocket and pulled out a revolver and tossed it into the front seat of the pickup before turning and walking back to his car. Sliding in behind the wheel he removed the wet hat from his brow and then reached inside his heavy coat and extracted a cell phone. Hitting a pre-programmed button he started talking. Tossing the phone into the front seat he started the car up, made a quick U-turn and sped away. And smiled. The gun actually belonged to the unconscious man. It was a weapon he had used before. On several homicides. The fool thought he had thrown the weapon away in a place where no one would find it. He was wrong. Ballistics would confirm the weapon to at least two murders. If the guy wanted to keep himself from frying in the chair he’d have to cut a deal with the police and turn state’s witness. And he would. With just a little persuasion. Two hours later the dark eyed man stepped over the second thug who had been assigned to kill the tall son of the old couple. The first hood was out in the middle of the abandoned warehouse lying on the floor staring up with lifeless eyes at the hole in the roof. Silently he moved behind the terrified young man tied down in a chair in the middle of an empty office in an abandoned warehouse. With a ‘Snick!’ the cold steel of a switch-blade snapped open. Two swift movements of a hand and the boy was freed. Motioning the pale faced, terrified boy to stand, the dark eyed man told him where he would find his parents. Handing the keys to the Caddy to the boy he told the boy t hurry and leave. But the kid, hesitating, looked into the dark face of the figure in from of him and asked . . .
A thin, cruel, smile barely creased the dark man’s lips. The black silhouette of a figure watched the kid hurry out of the office. Seconds later the lights of the XTS Caddy glowed through one of the warehouse windows and moved away quickly. With a harsh smirk on his lips the dark eyed man turned to look down at the dead man lying on the concrete floor. Bending down he searched the man’s pockets and stood up with a set of car keys in one hand. The only thing left to do was to confront the opposition directly. Her name was Bianca Torres. A stunningly gorgeous woman from Vera Cruz. Long black hair. Large luminous brown eyes soft enough to melt the heart of any fanatic. Lips full and red. A woman any man would covet. And many had died trying. She came out of the bathroom with nothing on but a towel wrapped around her voluptuous body. She had wrapped another towel around her head and was using both hands to dry her hair with it as she padded across the thick carpet of the bedroom toward the large round bed. But, sensing something amiss, she stopped in the middle of the room and turned around. “Smitty!” she hissed, her eyes widening in surprise. The large rambling house she owned just outside of town was as silent as a tomb. No sound—nothing to indicate anyone was alive in the house—came to her as she turned and faced Smitty. He smiled, reached to the carpet beside the chair he sat in, and held up an old paint can sans a lid. She glanced toward the vanity beside her bed furtively and then darted eyes back toward the dark eyed man. He smiled, deposited the empty paint can back on the carpet and lifted something off his lap. It was the long black clip from a Glock. The clip from the gun in the top right drawer of the vanity. He smiled, came slowly to his feet, and tossed the 14 shot clip onto the bed. She turned and glared at the bedroom door for a moment before whirling around to throw burning coals for eyes back toward Smitty. But he was gone! Disappeared out into the night through the French doors leading out into the back yard patio! Rage turned into a burning desire for revenge. With a scream she lunged across the bed and retrieved the ammo clip and then ran around the bed, threw open the upper drawer of the vanity and grabbed the Glock lying in it unmolested. Slapping the clip into the bottom of the grip she turned and ran out of the bedroom and into the darkness of the silent house. The noise of the 9 mm Glock going off repeatedly filled the rain soaked night air. Soon followed by another set of sounds. The wailing cries of approaching sirens. Several of them. As the gunfire continued inside the house Smitty watched from the darkness and rain as six Highway Patrol and county sheriff’s patrol cars, plus the dark lumbering van of a police SWAT team, filled the night air in front of the mansion with shafts of red and blue lights cutting through the rain. Turning, Smitty began walking away from the drama soon to erupt behind him. He knew Bianca Torres would never be taken alive. A killer like that couldn’t bear the thought of living the rest of her life in prison. Or frying in an electric chair. When the end came it was in a hail of gunfire and screaming obscenities. And in the darkness and falling rain he wondered if anyone cared whether there were heroes anymore. He certainly didn’t. 2 Responses to "There Are No Heroes"